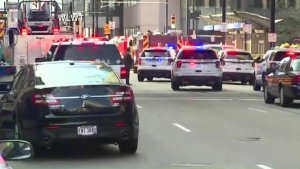 At least three people were killed in a shooting Thursday at the Fifth Third Center in Cincinnati’s Fountain Square, Cincinnati police Chief Eliot Isaac said. Police finished securing the building just before 11 a.m. ET, the chief said. The shooting began shortly after 9 a.m. The gunman entered a loading dock and opened fire before going into the lobby of the building, where three or four police officers engaged him, and gunfire was exchanged, Isaac said. “People in the immediate vicinity should remain on lockdown until further notice,” Cincinnati police said in a tweet Thursday morning. Police earlier characterized the incident as an “active shooter/officer involved shooting incident” in a tweet but did not elaborate.